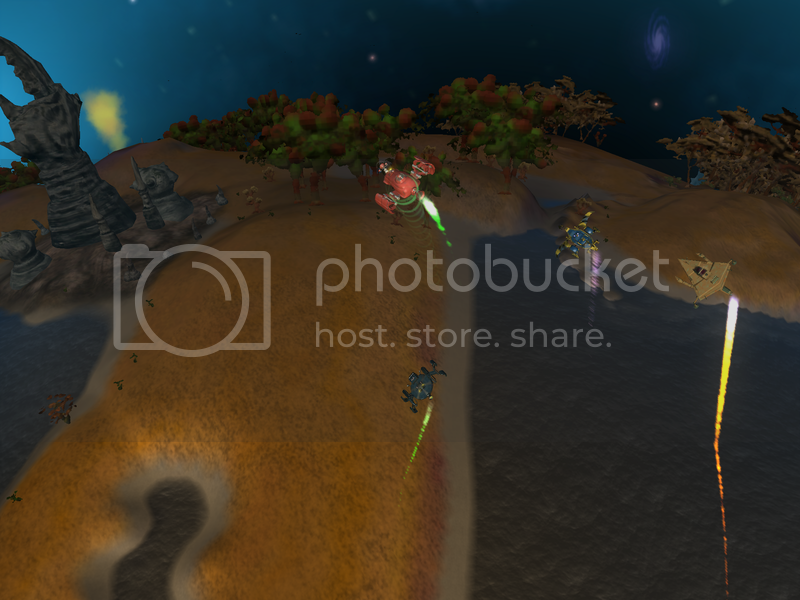 Spore: General / Re: Awesome Screenshots: Lets see them! The orange triangle UFO looks like mine. And the blue and yellow as well. Can you check their origin? Unfortunately, after getting my allies blown away, the fleet I reassembled was different. I'm pretty sure, though, that they're the same as the ones you linked. Yeah, I'm missing a number of mine as well when I look at the page. When I look in-game, of course, they're there. I think my highest was 1.2 million, but I've never seen a mission like that again since. That was for terraforming a planet to T3. Funny, but it was one of my planets, one I'd already terraformed to T2 for my colony. I really need to get practice grabbing screenshots, but I found this, my first unique planet. Those standing stones are pretty cool. It's the first uncolonized T3 I found, too, so had to take it. If they're still happy enough to offer, do missions for them. Some races offer a lot of attack missions, which you'll want to decline, but it doesn't seem to have anything to do with how aggressive they are. My first ally was a highly warlike race, who just happened to offer a lot of 'find this' or 'terraform that' missions. Missions are a major boost to your relationships. I've run into a ton of familiar names in my playthrough. Unfortunately, I wasn't really keeping track. I'll have to see if I took any good screenshots. I know I've run into a bunch of Hydro's stuff, and some of SpaceOddity's and Ondaderthad's. I haven't even gotten the game yet and I know there's keyboard shortcuts to replace using the scrollwheel. Not that I really understand the problem. Maybe it's the scrollwheel sensitivity? Because many, many, many other games use of the scroll wheel is pretty much a constant, especially RTS games, and I've never seen anybody complain about it. The 6100 is listed is an unsupported video card, so that's probably your problem. Unfortunately, no clue if you might be able to get it working. On one hand, I really hope they never delete anything. On the other, there's the example of the Sims 2 site, where they deleted anything that hadn't been featured after a certain length of time. Then again, Sims 2 stuff takes up a lot more space, too. I tried to relocate them to a livable T2 I wasn't planning on using a few systems away from my area. It wasn't the prettiest planet in the galaxy, but definitely survivable. I was actually surprised, but this weekend's Walmart flyer had the Galactic Edition listed, you might want to check there too. I haven't gotten the game yet to know if I'll have the difficulty problem, but I do agree I am disappointed that there doesn't seem to be a combat-free option. Seeing as this is a Maxis game. Give it a try and see? I think it should let you, but you'd probably need to place them on a T3 as well. No wonder the server's been having problems! This makes the CC's server load seem tiny by comparison.